As the days get long and hot, if you walk along the fencelines and down alleyways, you may be lucky enough to spot the humble chili pequin. Closely related to cayenne peppers, chili pequins grow in partially shaded spots under taller plants that provide them shelter. In San Antonio, they typically rest through the winter, resprouting again each spring, beginning to flower in late May, and fruiting once the temperatures begin to consistently exceed 90 degrees. 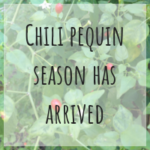 Chili pequin, Capsicum annum, are also known as bird peppers as they are most easily cultivated by birds eating the peppers and then naturally dispersing the seed. Their blossoms look like delicate little stars, white and five petaled, and are followed by a green fruit that ripens in a few days. The chili pequin fruits are a bright orangey red, quite small – only about 1/4 inch long – and oval shaped, but pack quite a punch at 40,000-80,000 scoville units, landing them between serrano and habanero peppers on the scoville heat scale. The peppers are also known to be high in vitamins A and C, have complete B complexes, and rich in calcium and potassium. We can use chili pequin peppers in a number of ways for first aid and wellness. Just like cayenne peppers, the main active compound capsaicin, is responsible for the spicy flavor as well as many of its health benefits, and in most cases chili pequins and cayenne peppers are interchangeable. Chili pequin peppers have a natural energizing effect on the entire body, and have traditionally been used to overcome fatigue, restore core body temperature, and enhance cardiovascular performance. 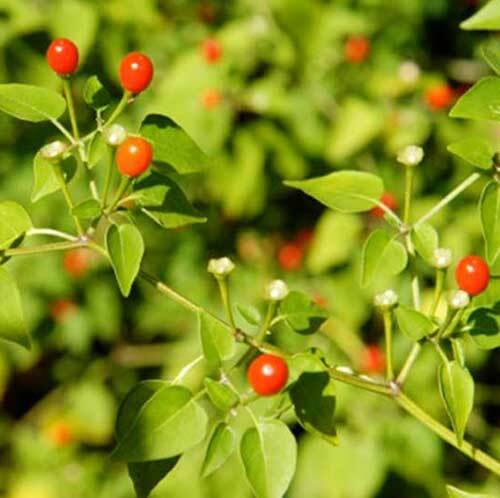 As a tool for first aid, we can use powdered chili pequin peppers on a wound to stop bleeding, and extraordinarily, chili pequins may be able to help shorten or prevent a heart attack. Capsaicin is known to have stimulating effects to the heart without the negative side effects of palpitations or hyperactivity, instead chili pequin peppers encourage organ secretion and peripheral circulation, and even lower blood pressure. This action is also very helpful with headaches and migraines, and has even been shown to quickly stop a cluster headache. One of the most common uses of chili pequins is for chronic indigestion. Taking a small amount before eating, after just a week or two, many people experience less pain, bloating, and nausea. You’ve probably even used capsaicin medicinally before! Readily available muscle creams and patches use capsaicin for it’s warming and pain relieving effects. We can make our own creams to help with a sore back by using these amazing little peppers! Chili pequins can be used in recipes in place of cayenne peppers, made into a tea or tincture, infused into oil for muscle rubs, and more. This is a versatile plant for eating and making medicine that you definitely want in your garden. So next time you are outisde with the kids or walking around the block, keep your eyes open for this very helpful plant! Place into a bowl the peppers, celery, carrots, onion, and cauliflower. Stir in salt, and fill with enough cold water to cover. Cover bowl securely and refrigerate overnight. The next day, drain salty water, and rinse vegetables. In a bowl, mix together honey, vinegar, and olive oil, then whisk in the spices. Stir in the olives and combine with vegetable mixture, cover, and refrigerate for 2 days before using.